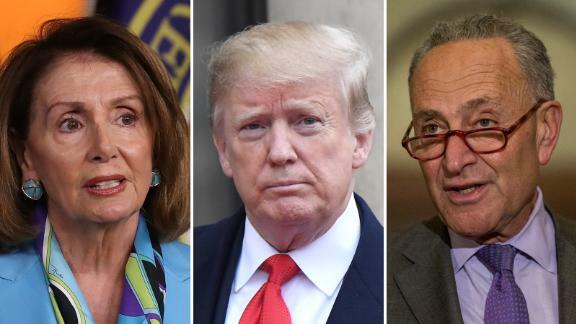 The White House will ask Congress for $8.6 billion for the wall in the new budget, sources told CNN, prompting a quick response from Democrats at the start of a new showdown over immigration, following last year's government shutdown drama. President Donald Trump delivered a 2020 budget to the Democratic-controlled House on Monday that cuts spending across the board yet still isn't projected to balance for 15 years, even with ambitious economic growth forecasts. The President's $4.7 trillion blueprint for the fiscal year starting on October 1 also revisits the political fight over border wall funding that triggered this past winter's partial government shutdown. Trump wants to cut funding for most federal government agencies by $2.7 trillion, while boosting defense spending and setting aside $8.6 billion for the proposed wall along the US-Mexico border. The initial rollout lacks details on individual programs, which are anticipated to be delivered later this month. But it sets the stage for the President's priorities heading into his re-election campaign, including immigration and national security. Though the plan comes with a built-in deficit of more than $22 trillion, Trump administration officials described it as a "return to fiscal sanity" that won't hinder economic growth. "This budget will have more reductions than any president in history has proposed," a senior administration official told reporters on a call Monday. The President's proposal would expand the federal budget deficit to $1.1 trillion in the next fiscal year, while also calling for balancing the budget by 2034 by assuming the economy will be able to grow faster than most economists anticipate. In its updated forecast, the administration is projecting that the nation's debt will balloon to more than $31 trillion in the next decade by 2029. It currently stands at more than $22 trillion. The senior administration official warned if the US government fails to address the nation's outstanding debt, interest payments alone would double by 2023 and exceed spending on the US military the following year. "President Trump's budget takes steps in the right direction, but there is still much work to do," said Steve Womack, a Republican from Arkansas who sits on the House Budget Committee. House Democrats have already called the plan dead on arrival, arguing that the proposal would leave the country less safe and secure with "no chance" of passing in the chamber that they control. "President Trump's budget once again lays out an irresponsible and cynical vision for our country, without any regard for its human cost," Kentucky Democrat John Yarmuth, chairman of the House Budget Committee, said in a statement. "President Trump hurt millions of Americans and caused widespread chaos when he recklessly shut down the government to try to get his expensive and ineffective wall, which he promised would be paid for by Mexico," they said in a joint statement. "We hope he learned his lesson." The budget asks for $8.6 billion to build a wall on the southern border of the US, which includes a $5 billion request for the Department of Homeland Security and $3.6 billion for the Pentagon's military construction budget. As in previous years, Trump's blueprint also calls for $200 billion for infrastructure spending, with the Trump administration open to working with Congress to construct a package that could attract bipartisan support. Trump's budget proposal includes funds for hiring across federal agencies, including US Customs and Border Protection and the Department of Justice's Executive Office for Immigration Review, both of which have already had trouble filling vacancies. That includes $314 million to hire an additional 1,000 ICE law enforcement officers. The administration is also asking Congress for $40 billion to fund the State Department's work on international diplomacy and aid in fiscal 2020, a slight increase from last year's request but nowhere close to addressing deep cuts made in 2017. The Trump administration's emphasis on funding the Pentagon over diplomacy has alarmed retired military leaders, who said Sunday that squeezing the State Department budget undermines US security and leadership. "The military alone cannot keep our nation safe," more than a dozen former combatant commanders, including retired generals David Petraeus and Anthony Zinni and retired admiral James Stavridis, said in a statement urging Congress to protect funding for the State Department.